Did you even know there was such a thing as Mineral Sunscreen? 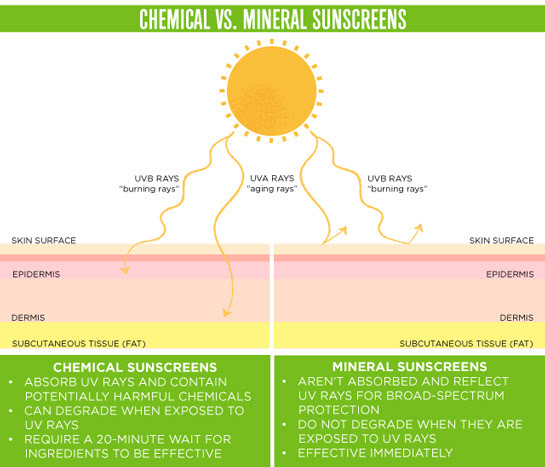 Thinking about Sunscreens most of us would not know that there are 2 types of Sunscreens: Mineral and Chemical? Each of these work in very different ways and it is important to know what to look for and why Mineral is the safer choice. A mineral sunscreen will offer immediate and lasting protection. Most of us have been told that when we apply our sunscreen we should wait about 15 minutes or so to allow the sunscreen to set. This is because with a chemical based sunscreen the chemicals have to complete their reaction on your skin before they are effective. An ingredient by the name Avobenzone is a relatively safe and a common ingredient in sunscreen, the problem is that it breaks down quickly in sunlight (defeating the purpose) so it requires other non-safe ingredients to be add for stabilization. The other issue is that liquid plastics are also used to keep chemicals from being absorbed too quickly. With natural mineral sunscreens they are not as complicated; they are effective and stay that way requiring no toxins and no liquid plastics. Sensitive skin is a common concern for many people these days, especially with children. Mineral sunscreens are wonderful for those with sensitive skin due to the fact that natural minerals reflect the UV rays and are not absorbed by the skin. With chemical based sunscreens they can cause long-term health risks and can trigger allergies and skin reactions. Avoiding chemicals all together as much as possible for those with sensitive skin is highly recommended. Traditional sunscreens use a wide range of chemicals that absorb and scatter the sun’s rays into your skin. Because of the UV rays, the chemicals are absorbed and can make it into your bloodstream. Octinoxate is the most widely used UVB blocking agent and is made by combining sulfuric acid with methanol, which is a petroleum product. Oxybenzone is one of the worst chemicals and is known for being an endocrine disruptor; it is in the same group as BPA. However, Oxybenzone is even more powerful than BPA and people rub this directly into their body’s largest organ (your skin) daily! Mineral sunscreens like Young Living’s, use natural non-nano zinc oxide and skin nourishing essential oils that act like mirrors to simply reflect the rays away. Zinc Oxide also provides natural broad-spectrum from both UVB ( burning) rays as well as the UVA (aging and damaging) rays. Traditional sunscreens guard against UVB rays, but most do not protect against both UVA and UVB. The key is to checking a label and seeing it labeled broad spectrum. My favorite is also this; mineral sunscreens are gentle and kind to Mother Nature! Let me put it like this for you…. If it is not good for you, it isn’t going to be good for our planet. Traditional chemical sunscreens laced with octinoxate and oxybenzone are damaging to the coral reef, these chemicals awaken viruses in the algae the reefs use for nutrition. Once that algae dies, so does the reef and these reefs provide homes to 25% of all ocean life. We can do our part by slowing down the disappearance of reefs by switching to mineral sunscreen. When we do something the same way for so long making the switch can be so overwhelming, but by getting educated and making better choices you can be assured that you, your family and our planet are safe! Then just go out and have fun in the Sun without worries! Combined all ingredients carefully and give it a nice shake. Apply blended as needed to swollen, painful areas as joints and muscles. Also wonderful for swollen feet. Lemongrass is especially helpful for reducing fungus.